Playa Taurito is a purpose built tourist resort which caters very well for families. It is certainly not big and would most likely suit younger children rather than teenagers, there is a large water park with a variety of flumes, fountains and pools in the centre which has sun loungers so parents can keep an eye on their wee ones. We were there in winter, low season, apparently the resort gets very busy in the summer. There are a several shops selling the usual tourist trinkets, a couple of bars and a small park with unusual cactus & other tropical plants. You can walk right round the entire resort in about half an hour, it's a nice walk. The beach is quite smallish too but has all sorts of water sports like scuba diving,jet ski-ing and para sailing. Playa Taurito is one excellent resort if you are looking for peace and serenity. 7 hotels and a waterpark. And a few shops. The mix is perfect for a quiet holiday. Our hotel Lago Taurito had free access to the waterpark which was just outside the main enterance. The balcony views were perfect from floor 3 upwards. Bus stop at the end of the road 200 yards to take you to wherever you wanted on this wonderful island. Mogan costs 1.40 Euros. This is not a resort for the Headbanging partygoers......which is why we chose it. Good choice Willy. Taurito resort is a quiet place and that is why we booked it. The lower part of taurito has a waterpark and small aviary, ideal for kids. the resort itself is well maintained and clean. The beach is craggy but pleasant. No entertainment at all only in the hotel. Playa Taurito is a resort built within a ravine that is open to the sea....the sides of the ravine are lined with hotels...the shops are below the hotels, and the entertainment is in the bottom of the ravine...there is a waterpark in the centre...this is free entry if you stay at the Lago Taurito hotel...there are tennis courts , and a football pitch, these are not included in the AI packages and 8euros an hour to hire ...there is a large fittness trail I think is free to use...there ia a brilliant crazy golf court 4euros each and well worth it...a new amusement arcade has been built with a bowling alley in it,and there are large pergoda type avairys around the grounds with parrots in....the lago taurita has a jaccuzzi which I think anyone can use..
Down in the beach area there is a diving school and water sports ....the beach is very clean but has black sand. Calling Playa Taurito a ‘resort’ is a bit misleading as it’s really just a small selection of hotels and shops next to a beach. 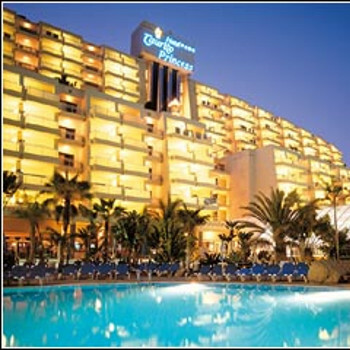 We were happy with it though – it may be very low-key compared to other resorts in Gran Canaria but it had everything we needed. All in all, we really liked Playa Taurito and the Mogan Princess and wouldn’t hesitate to recommend them both to anyone who wants a quiet resort that’s a good base to see this island. This is a purpose built resort much quieter than Playa Del Ingles and Costa Rica. Very few shops and no touts trying to sell you things you don't want. For us just right! There are no bars or cafes other than the hotels .afew shops,which are qite expensive, the lido is large and clean.the whole resort takes 15 mins to walk round .but you are near enough to other resorts to go out for the day or night.buses are cheap and regular, and there is a taxi rank.A taxi back from puerto rico cost us 15 euros. Limpeza inexistente, nenhum esforço do staff para agradar e tornar mais fáceis as (in)comodidades, chauvinismo tipico do staff relativamente a todos os estrangeiros, um cheiro nauseabundo e persistente junto da piscina, animação muito fraca, enfim ... riscado do mapa!